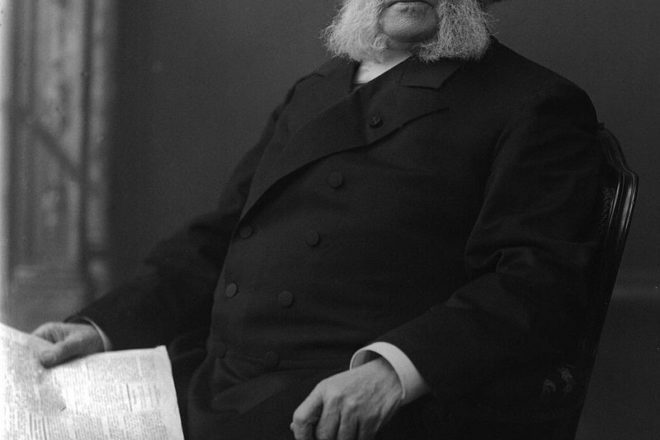 Henrik Ibsen, whose work “An Enemy of the People” will kick off TAP’s Play-Reading Festival. Photo by Gustav Borgen, NFB-19775. Third Avenue Playhouse (TAP) will hold its third annual Play-Reading Festival Feb. 15-24. This year’s festival presents plays by six American playwrights, including an adaptation by a noted American playwright of a Norwegian classic and a Wisconsin premiere. The 2019 series includes An Enemy of the People by Henrik Ibsen and adapted by Arthur Miller (Feb. 15); The Curious Incident of the Dog in the Night-Time, based on the novel by Mark Haddon, adapted by Simon Stephens (Feb. 16); the Wisconsin premiere of Into the Breeches! by George Brant (Feb. 17); A Life in the Theatre by David Mamet (Feb. 22); Orson’s Shadow by Austin Pendleton (Feb. 23); and Fifth of July by Lanford Wilson (Feb. 24). The festival’s opening night, Feb. 15, will be a collaboration with Door County Reads. An Enemy of the People tells the story of a small Norwegian town that has begun to win fame and wealth through its medicinal spring waters. Dr. Stockmann, the resident physician in charge, discovers that the waters are poisoned. On receiving proof of this, he immediately reports to his associates but is shocked to find that instead of being thanked, he is looked upon as a dangerous crank. It’s a battle of political ambitions and moral integrity. First performed in 1883, Ibsen’s classic play still resonates today. In The Curious Incident of the Dog in the Night-time, 15-year-old Christopher finds himself under suspicion of murdering his neighbor’s dog, Wellington. He records the facts of the crime, and his detective work — forbidden by his father — takes him on a thrilling journey that upturns his world. Into the Breeches! takes place in Providence circa 1942. The Oberon Play House’s director and leading men are off at war, so the director’s wife sets out to produce an all-female version of Shakespeare’s Henry V.
Pulitzer Prize-winning playwright Mamet takes the audience into the lives of two actors in A Life in the Theatre. One actor is John, who is young and rising into the first flush of his success; the other is Robert: older, anxious and whose career is beginning to wane. Orson’s Shadow is an ingenious tale of two Hollywood giants: Orson Welles and Laurence Olivier. In 1960 at West End theatre, critic Kenneth Tynan has made a startling proposal: Welles should direct Olivier and the young Joan Plowright in Rhinoceros, Ionesco’s absurdist masterpiece. But it is the rehearsal process that brims with absurdity as titanic personalities, including Vivien Leigh, wrestle the muse in this witty and incisive depiction of the drama of theatre. Fifth of July is the third play in the Talley Family Trilogy, along with Talley’s Folly (presented at TAP in 2015) and Talley and Son. Alternately funny and moving, it deals with a group of former student activists and the changes that have been wrought in their lives and attitudes in the years since leaving college. The cast of the readings will be announced at a later date. Readings will be held Friday and Saturday at 7:30 pm, and at 2 pm on Sunday. Admission is pay-what-you-can donations. For more information, visit thirdavenueplayhouse.com.